Impact noises: what is the difference between IIC, FIIC and AIIC? Acoustics is known to be a complex science in which every detail counts. Noise is a major irritant for people living in co-property and is one of the most common cause of complaints, discordance and even litigation. Noises arise from diverse and non-harmonious vibrations which can fall into two categories; impact or airborne. Impact noises can originate from different sources and can be measured in multiple ways. Impact noises are caused by shocks or vibrations such as moving furniture, someone walking or running, an object falling to the ground. These impact noises (vibrations) are then transmitted to the building structure (floors and walls) creating discomfort and nuisance. 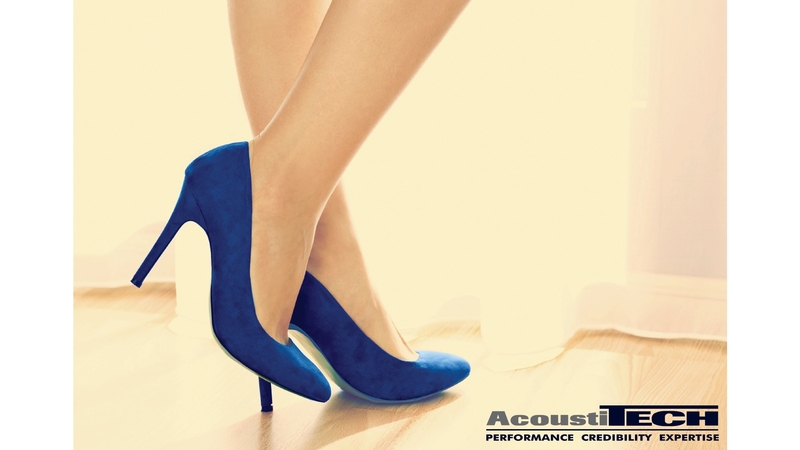 AcoustiTECH membranes reduce impact noise transfer by “decoupling” (separating) the floor covering from the subfloor. IIC stands for "Impact Insulation Class", the degree of soundproofing of the impact noise of a floor/ceiling assembly in a laboratory. The higher the IIC, the better the acoustic insulation. This measurement index, obtained by standardized acoustic tests, is done in a laboratory where the testing and site conditions are controlled. FIIC stands for "Field Impact Insulation Class". This is a unit of measurement that determines the degree of soundproofing of the impact noise of a floor/ceiling assembly on site rather than in a laboratory. The higher the FIIC, the better the acoustic insulation. A FIIC test is carried out on site, in real buildings. It can be argued that this rating is more representative of reality than a IIC laboratory test. AIIC stands for "Apparent Impact Insulation Class," which is the insulation index of the apparent impact noise of a floor/ceiling assembly on site. Since ASTM E1007-14 and ASTM E336-14 came to affect, details have been provided on how to measure and present the results of acoustic tests carried out on site. All new tests carried out on site will now be preceded by the letter "A" rather than "F". Other than designating the unit of measurement for acoustic efficiency, these changes represent more accurately the reality of an onsite test, with its characteristics and weaknesses. The changes make the ASTM standards more accurate and eliminate border line cases due to the disparity in volumes and shapes of the measured rooms. Without going into the details of this new regulation, the application of these updates will allow us to obtain results that take into account indirect sound losses related to generally accepted construction methods. For current acoustic standards, for floor/ceiling assembly in multifamily buildings with more than one floor, the National Building Code (NBC) does not require a minimum Impact Noise rating but recommends a FIIC 55.